When including a bird of any size and species in your household, take time before the transition to prepare. Use these tips to welcome your new bird and create a happy experience for your family. Choose housing with bars or slats that are only half the width of its head. All the bars should be parallel to try to prevent the bird from injuring a wing or foot. Decide where your bird's cage will be placed before you bring your new pet home. A sunny room where the family spends most of their time is best. Always place your bird's cage at your eye level to discourage dominance and encourage obedience. Plan to socialize and train your bird so it will learn supportive behaviors and not focus on destroying its cage or plucking its feathers. Provide appropriate toys, treats and food choices for your new bird. Your home may be one of the many households enjoying a bird as a pet. The American Veterinary Medical Association estimates that birds, though not nearly as popular with Americans as cats or dogs, reside in 4.5 million households. Birds aren't always the first pet that comes to mind for children requesting that perfect pet from their parents, and parents should be wary of letting children handle birds as they are easily injured and do frequently bite. What is it about birds that make them good household pets? Friends of a Different Feather by Michelle Sathe indicates that there are positives to pet bird households. When you want to add a pet to your family and think you'll enjoy a feathered friend, remember to check with your nearby veterinarian for recommendations, adoption opportunities and guidelines for wellness and good health. Birds are available in many sizes. The size of your new pet should be appropriate to the size of your home and the space you have available for it. Your bird choice can be a big parrot or a tiny canary - and everything in between. Birds have various life expectancies. Generally, the larger the bird the longer it will probably live. Large birds of the parrot family can have a life expectancy as long as a human. Your pet bird will need care, though you won't be out for a walk like your neighbors who have dogs. Your bird will require a cage and space that is free from debris, feces and trash. It will need a cage-cleaning on a regular basis. Your bird will have specific nutrition needs. Veterinarian Marlene Anschultz advises that each bird species requires its own special diet and maintenance. You'll want to establish a relationship with your local veterinarian and have regular checkups and nutrition support. Birds can be vulnerable to certain illnesses, viruses or diseases like other pets. Your veterinarian will help you learn how to care for the bird species you select. Remember that larger birds can have longer lives. Dr. Anschultz also advises that "small birds are social among each other and are better off in an aviary, so you can get two or three of them and put them in an enclosure. 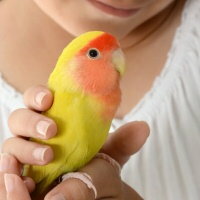 Bigger birds, such as parrots, need constant affection, attention and holding." She admits that some people find birds irritating, disturbing or unpleasant. These people are not willing to enjoy life with a pet bird. Other people get enjoyment from birds and realize that birds can provide companionship, make you laugh and make your family smile with delight. "Some birds cackle along with your jokes and make fun of you afterward," she says. "They can be real characters."